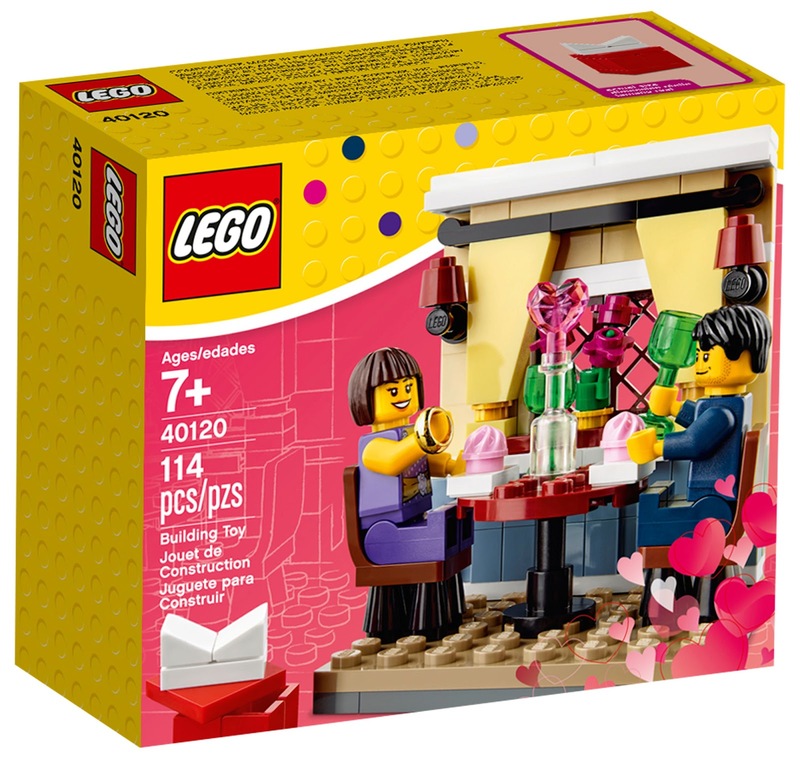 New images of two romantically themed sets have appeared, continue below to check them out. 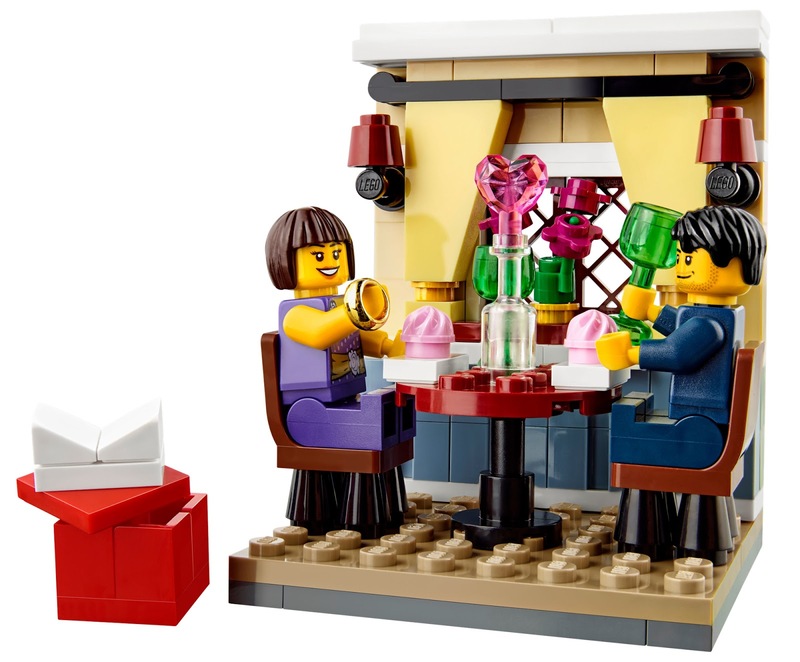 Lego have revealed their 2014 Valentine's Day set, 40120 (so far unnamed), which is a little minifigure marriage proposal scene; a window-side table at a restaurant, with a heart-topped bottle of something and a ludicrously scaled box to contain the ring. 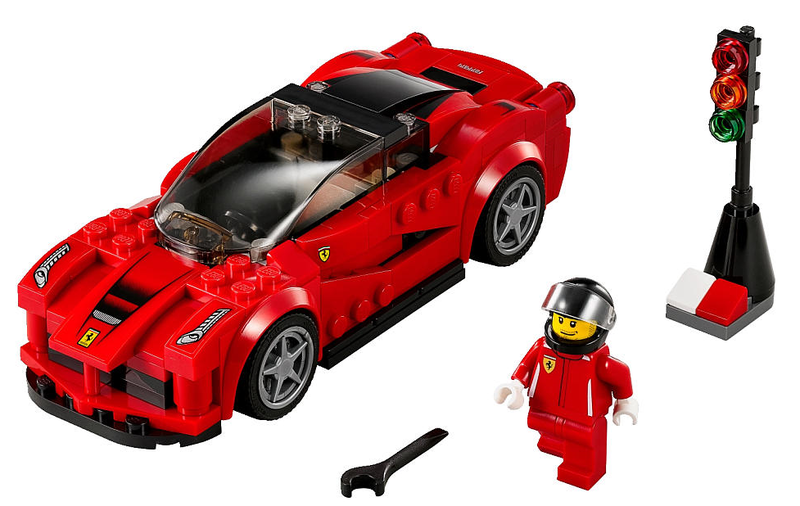 The set was discovered on the Lego image archive by Brickset. The next year in the Chinese zodiac is the Year of the Sheep, and Lego have released a set to commemorate it. 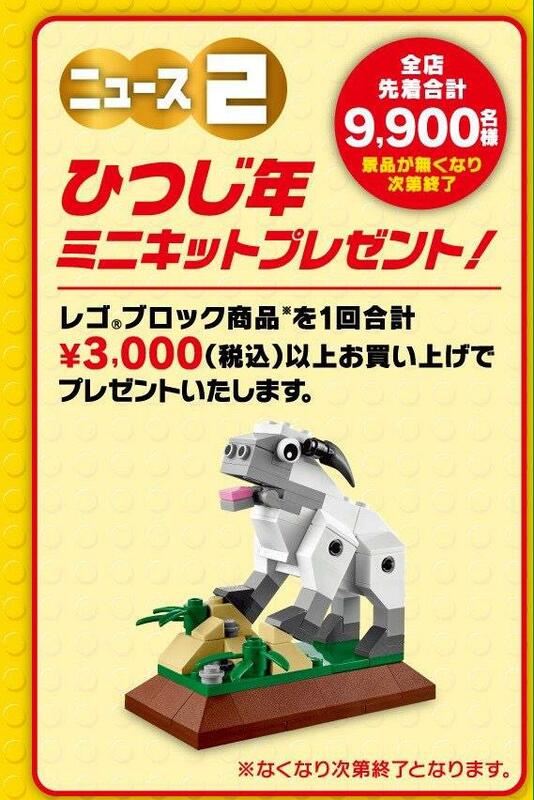 At least if you live in Japan they have, where you can find 40148 Year of the Sheep. A Japanese website, Lego Train, posted the advert here, while a Brickset reader sent in images of the packaging (see after the jump), revealing how it comes with a gift envelope, ready to package the Lego set up with other new years presents. This could well be the continuation of an annual tradition, following the release last year of 10250 Year Of The Snake. Page created 5th October 2014. Last updated 28th December 2014. 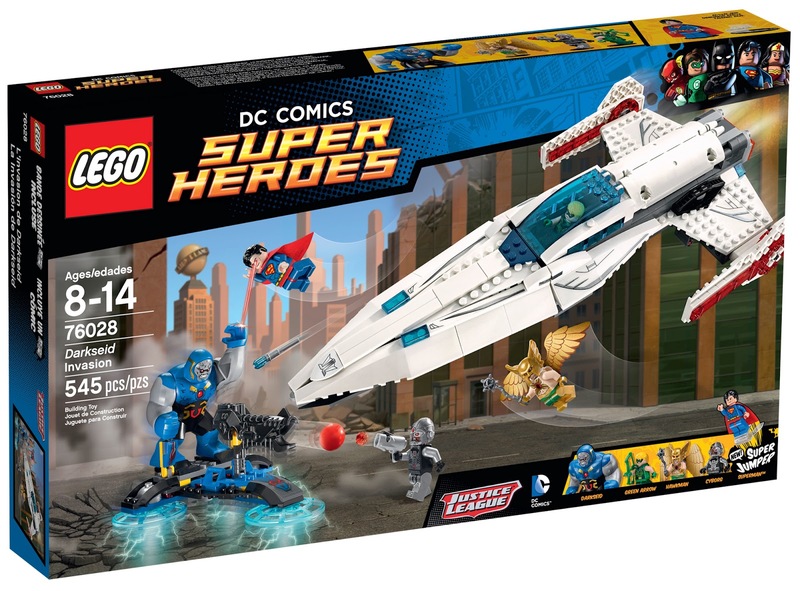 For the 2015 wave of DC Super Heroes Lego sets, the Justice League is being allowed a bit more into the spotlight, and although Batman (who has dominated the DC Super Heroes range so far) still features in three of the four regular retail sets, there is more space for other characters and not-bat-vehicles. 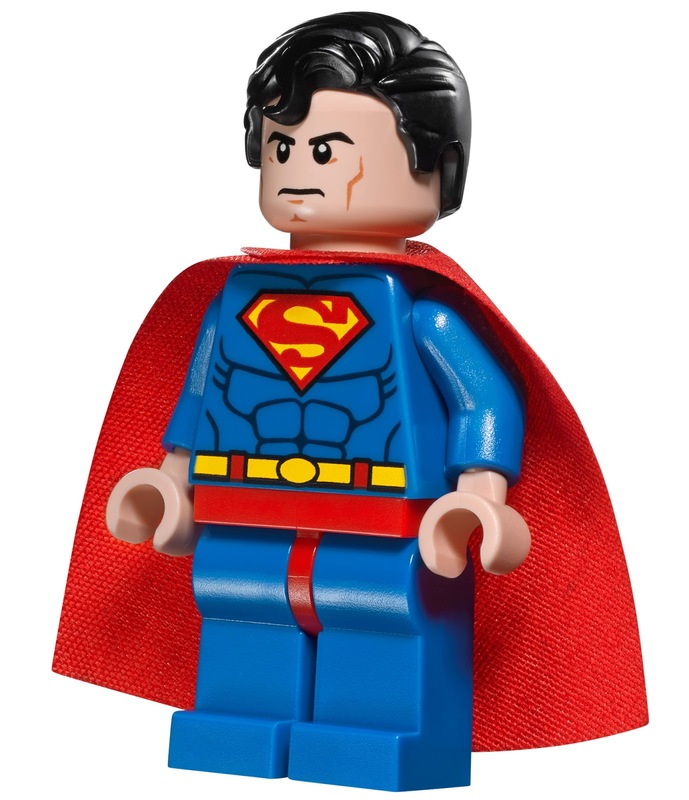 Four sets include a new "super jumper" part, which appears to be there to allow you to launch Batman, Superman, or whoever else you like, into flight. 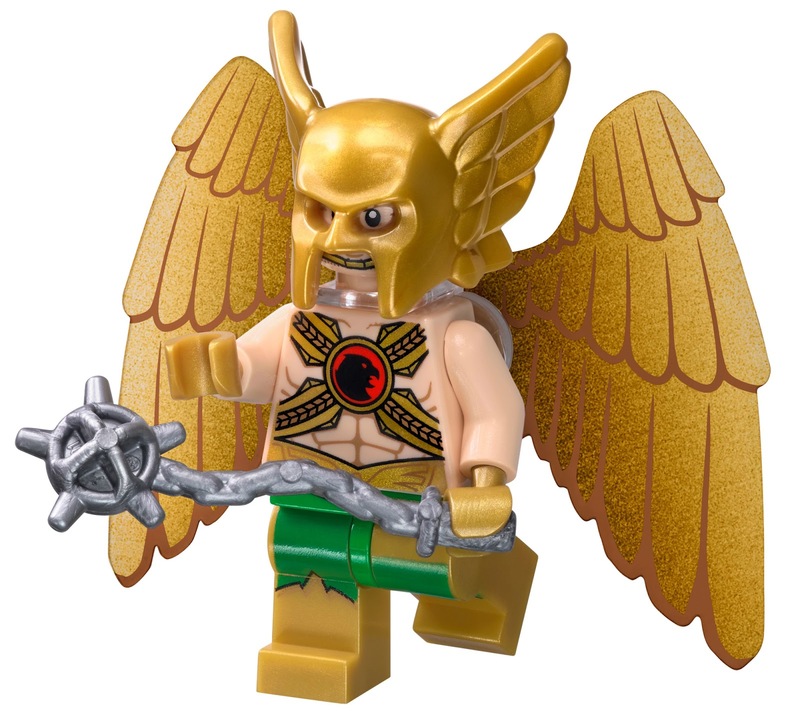 As is quite typical of this wave of releases, this set features quite a varied assortment of characters (aesthetically at least, I've no idea about their in-universe affiliations), with the most eye-catching to me being Hawkman, whose feathery wings and winged-helmet I can see have some nice fantastical applications beyond the super-hero realm. 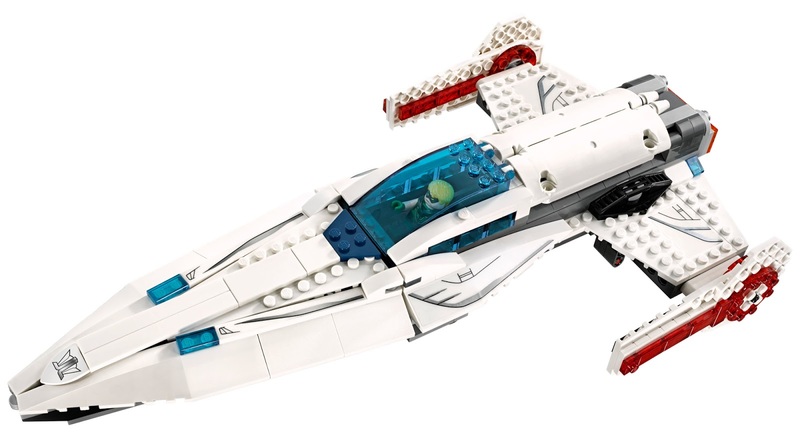 The centrepiece of the set is a big rather oddly proportioned jet, which seems to be facing off against what is basically a hovering turret. 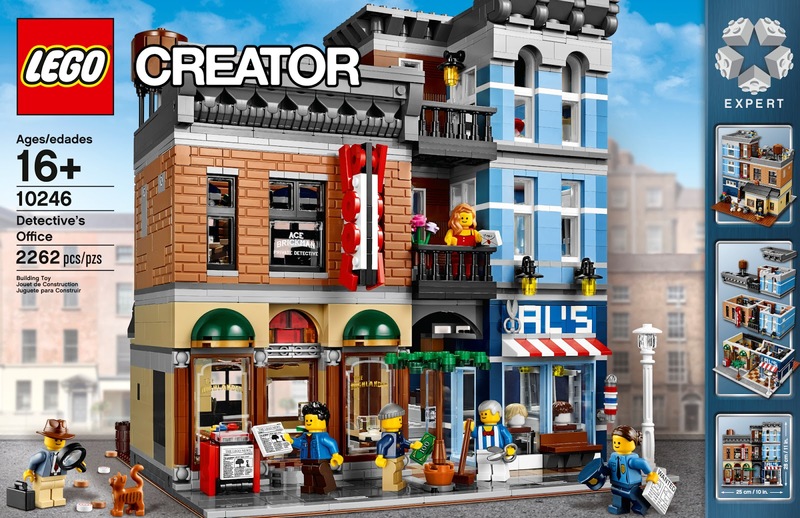 Lego have announced the latest Creator Expert set, and the tenth set in the modular building series, and have really gone to town detailing this one, 10246 Detective's Office. The building is in fact multi-use, with the office taking up the first floor, opposite a period toilet, while below you'll find a pool hall and barber shop. The third floor has a kitchen and roof area, complete with skylight and water tower. 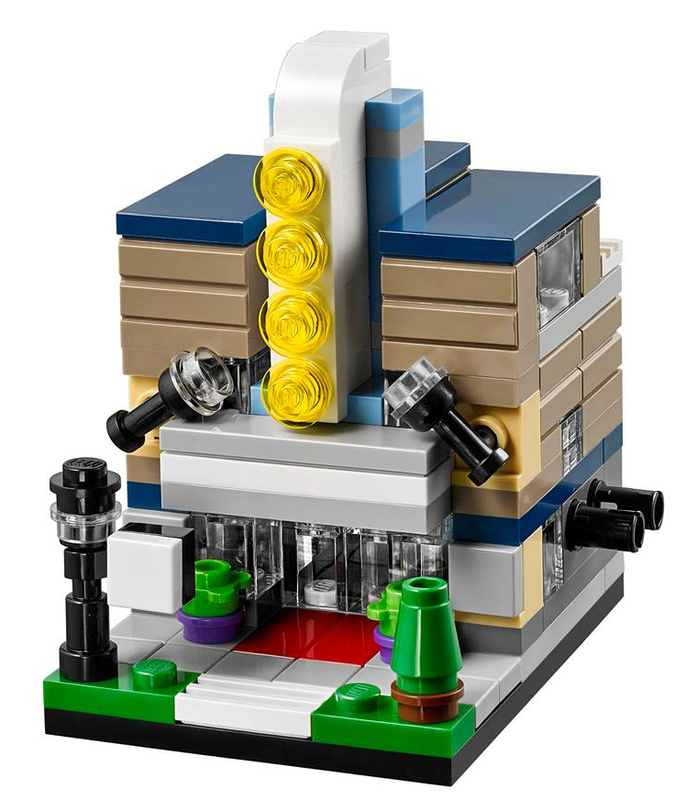 As is customary in the modular building series, there are some really creative building techniques and parts use, including using Unikitty's tail element for architectural detailing, and making use of the new mini-ball hinges to hold up columns. There are new parts in the form of scissors and a large reflective mirror tile. Plus lots of great printed parts, including lots of newspapers, a dart board, and a brilliantly generic wanted poster, and the window of Ace Brickman's detective agency.. 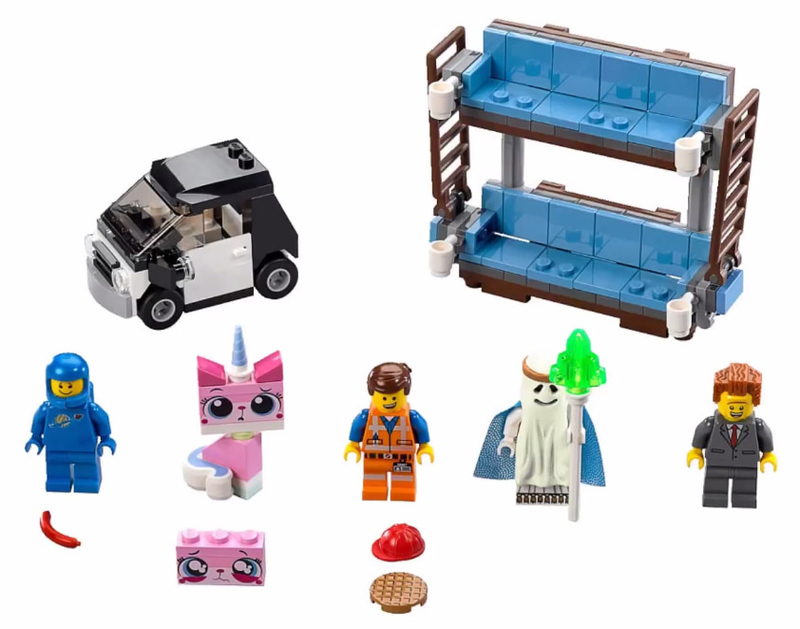 There are six minifigures, including the detective, a police-woman, and barber. The enraged Emperor sends Darth Vader and his entire fleet to find and destroy Luke as revenge for his destruction of the Holocrons. Luke, however, finds inspiration from the last remaining Holocron -- a daring move pulled off years earlier by his father, Anakin. The emboldened Luke uses Anakin’s daring move to lure Vader and the Imperial Fleet into a trap that could turn the tide for the Rebellion… or lead to disaster. 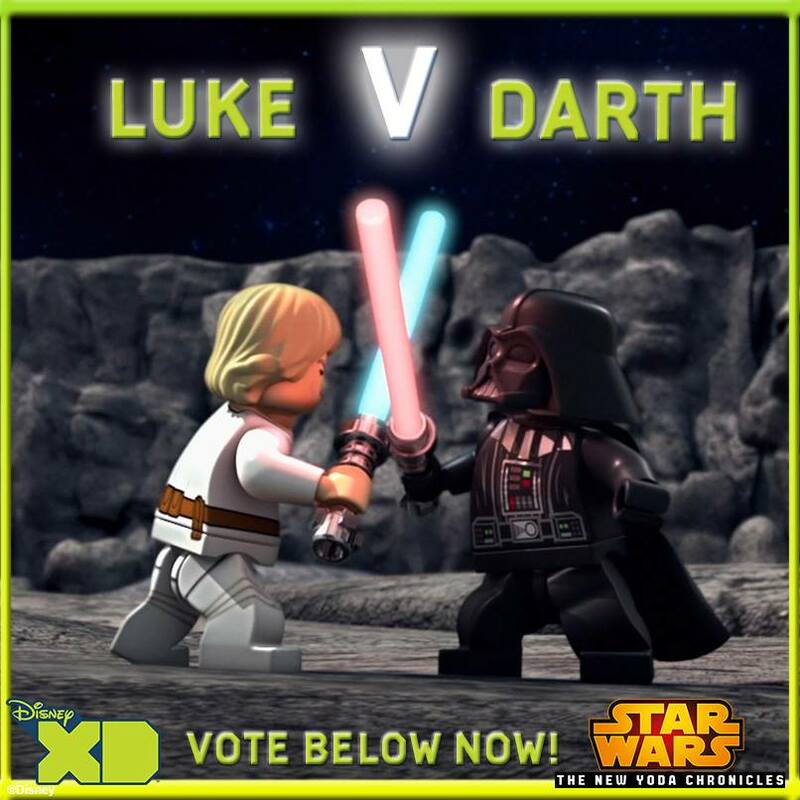 Unusually it appears the outcome of the confrontation is down to viewer preferences, as endings for both sides have been animated, to be broadcast as determined by social media votes. I'm not all that knowledgeable about comic books, so when the new movie Batman v Superman: Dawn of Justice was announced I was a bit perplexed: Aren't those both "good guys", how the heck could some guy with gadgets battle someone with actual super powers?? 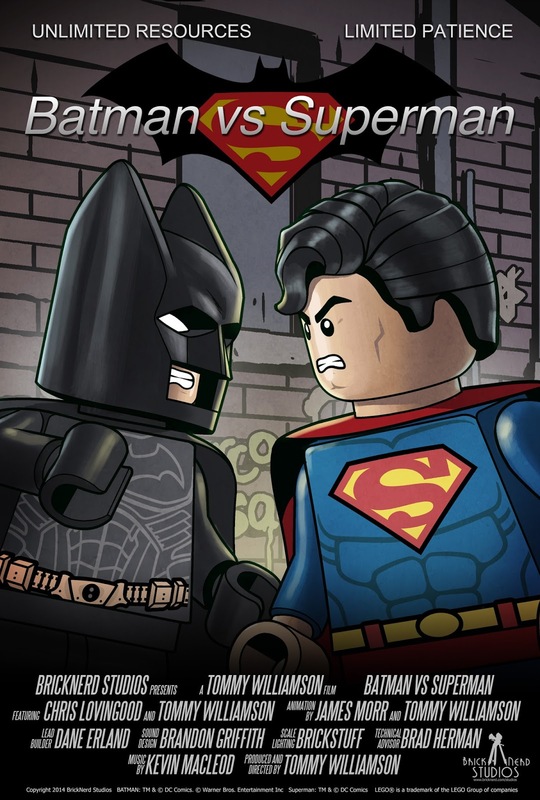 Well, that's exactly what Brick Nerd has examined in this amusing new brick-film, Batman vs Superman. It's very well made, and done so with enough love put into it that it even has a poster, by Paul Lee. Page created 31st August 2014. Last updated 17th November 2014. 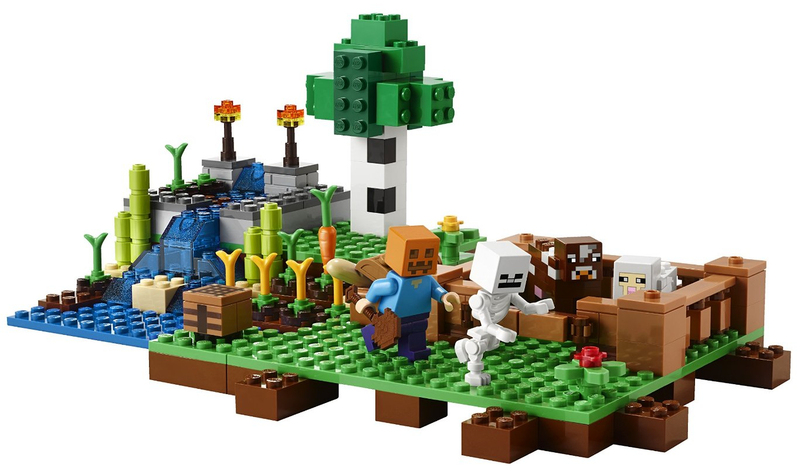 Following the successful series of "Microworld" sets based on Minecraft, Lego are expanding their range this year, with larger minifigure scale sets. 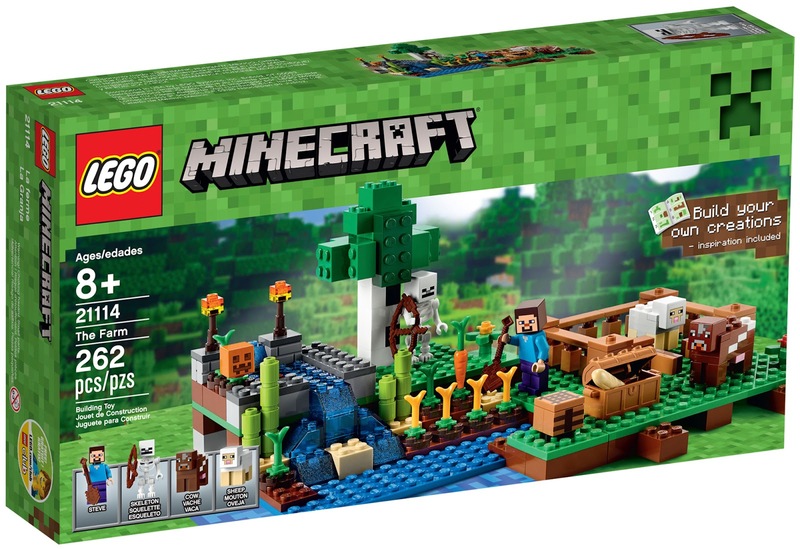 There are six sets in the range, including various settings from the game, featuring an assortment of Minecraft-style minifigures, animals, and accessories. 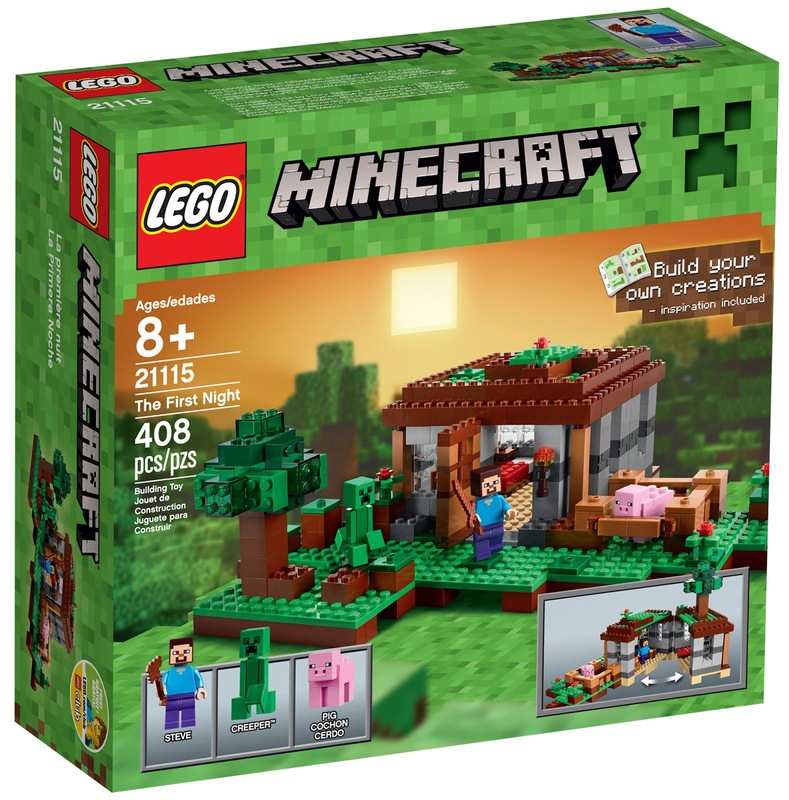 Lego and Minecraft and bound by the core concept of building things, and these sets all come not just with a set of instructions for the featured design, but inspiration for other builds too. 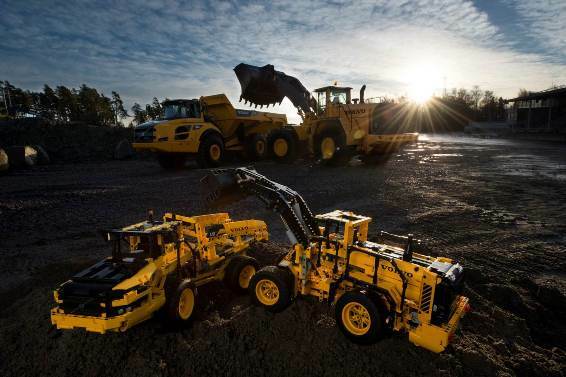 They are also highly modular, meaning sets can be both easily rearranged within themselves to create different scenes, and connected together to create a large Lego Minecraft world. 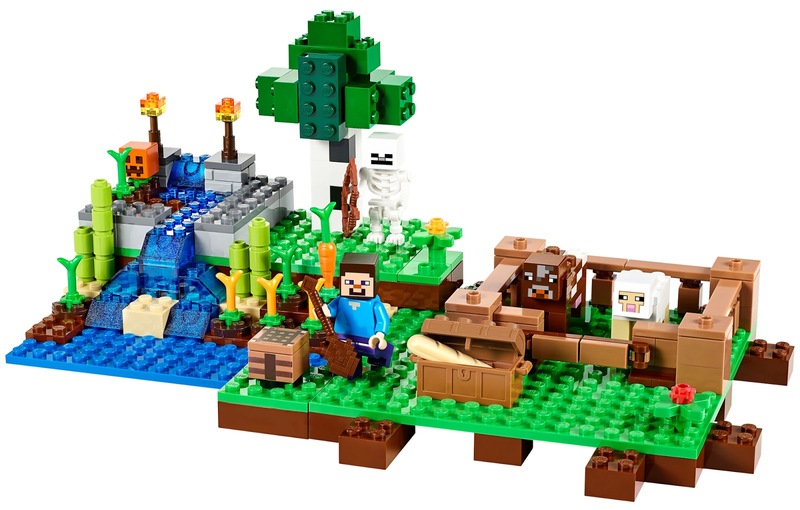 The aesthetic of Minecraft is very blocky, which translates well into Lego form, although perhaps ironically makes the sets seem more simple than most modern Lego designs - In many ways these are very pure Lego sets; few embellishments, and lots of basic bricks. Even if you're not familiar with Minecraft there are interesting parts and designs to be found in the range. 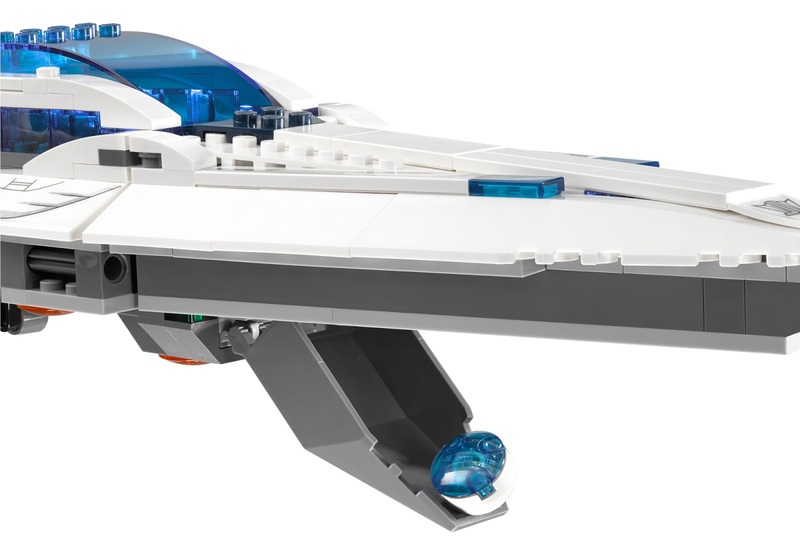 Continue below for a look at each set - As someone who's never played the game I'll be examining them purely as Lego sets. UPDATE: Now with lots more images! This outdoor location comes with a pen for keeping the included cow and sheep in, plus a small grassy area, waterfall, and tree. 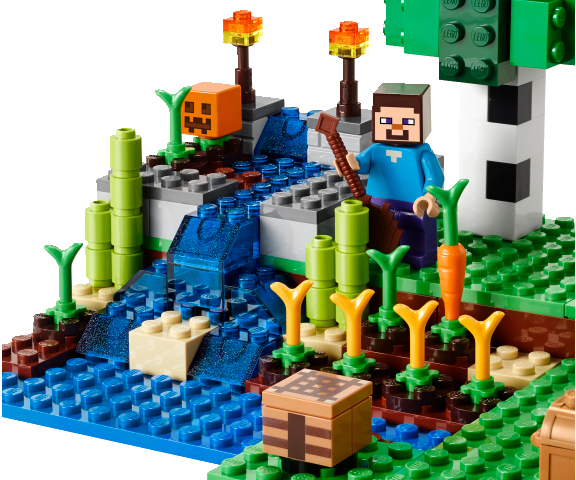 I really like the blocky tree design, and would find that quite acceptable in any Lego environment. The animals feature a new cube-head brick, and a different cube is used as the head for the included minifigures, as well as the pumpkin. 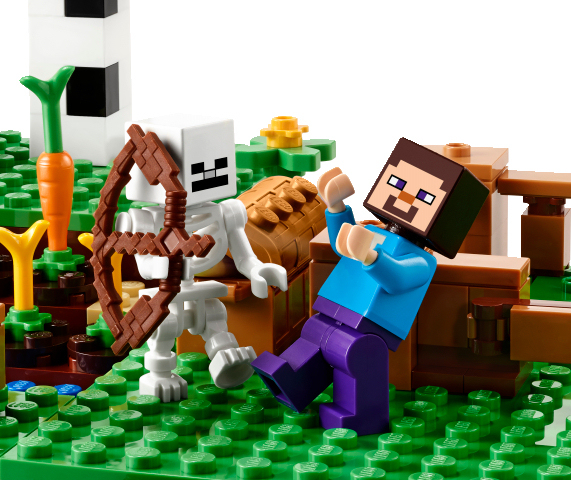 There are a couple of new Minecraft-styled accessories included, a spade, and a bow and arrow. This also looks like quite a good sets for plant-parts, with several large leafy plants, flower-style studs, and carrot tops (including a few for the first time in a light orange colour). Purchase: Amazon.com, Amazon.co.uk, Amazon.de, Amazon.fr, Amazon.es, Amazon.it, Amazon.co.jp, Forbidden Planet. Green and brown are again dominate colours in this little house set, which hinges open to reveal the interior. 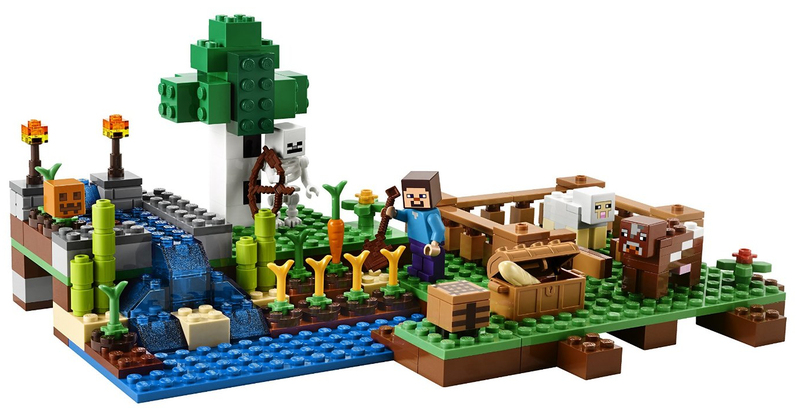 This set also has an animal pen, this time holding a pig, while Steve is able to roam free, with his sword or axe, and meet the Creeper. There's another tree in this set, which this time is part built from transparent-green bricks. The Creeper is an interesting construction, featuring a single part making it's legs and body, with tiles attacked to bulk it out, and the Minecraft head cube on top. It will be interesting to see if the central component to that has potential for use other than a Creeper body. 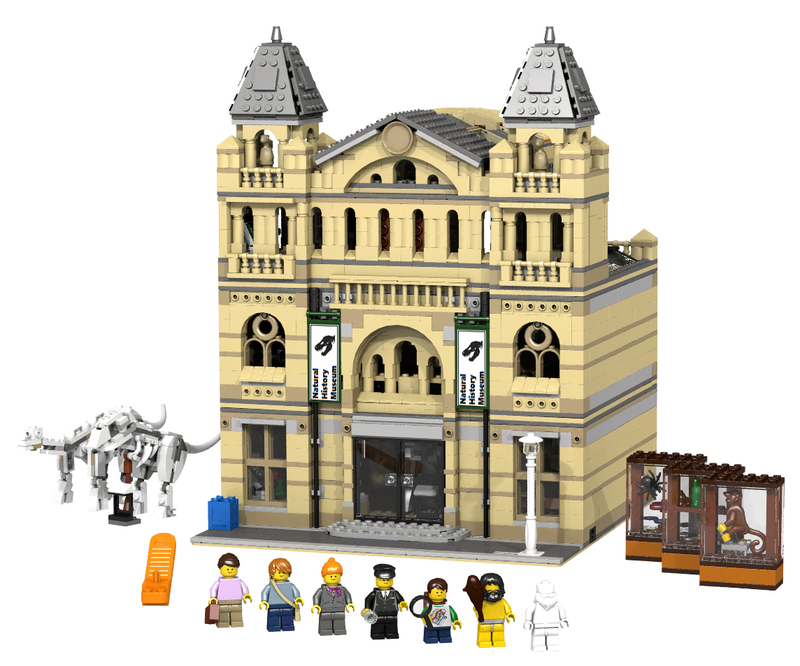 The Natural History Museum modular building project on Lego Ideas has become the latest to reach the ten-thousand supporter mark, and therefore qualify for the next Lego review period, where it will be considered for production as a real set. The beautiful build is based on the iconic Natural History Museum in London, featuring many of it's most famous exhibits, including Dippy the diplodocus, the huge redwood sample, and the statue of Charles Darwin. 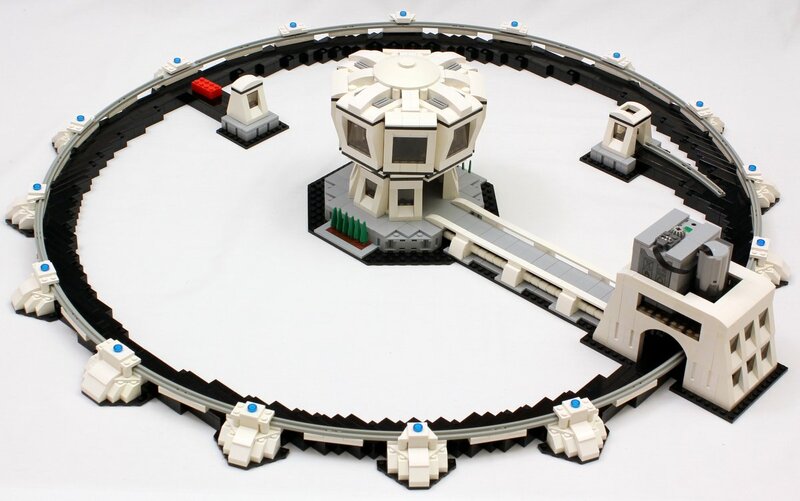 The creator of the project, tjspencer1, recently updated the project with a slightly smaller version (pictured), bringing it in line with the piece count of existing modular building sets. 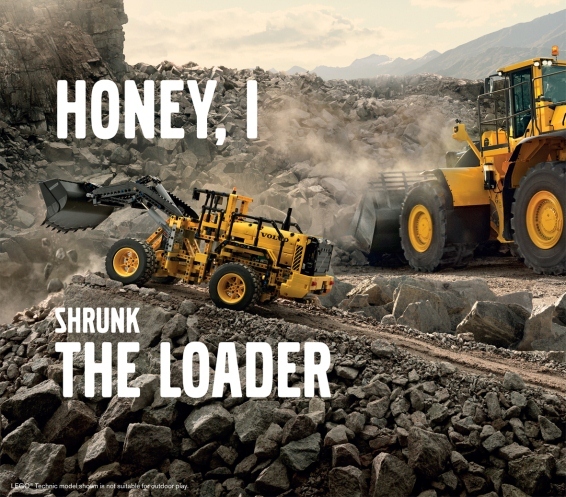 I'm normally pretty sceptical of huge projects on Ideas. 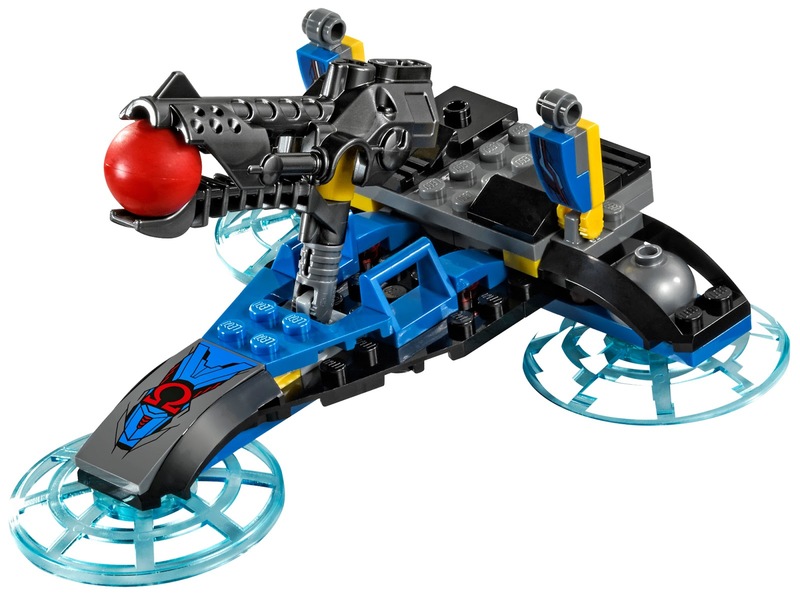 But I love this design, and given it would fit in so well with the other modular building sets, I really hope Lego consider going ahead with it. I don't want to give spoilers but there will be more female characters and more female stuff. It's important to us that the movie plays broadly and that we inspire young women as much as we inspire young men. You can feel that the whole movie culture is now starting to wake up to the fact that half the audience are women. Frozen is reflective of that - and I think we are all going to find a great flourishing of women film makers and subject matter in the future. Whatever the inspiration, sounds like a good move to me! 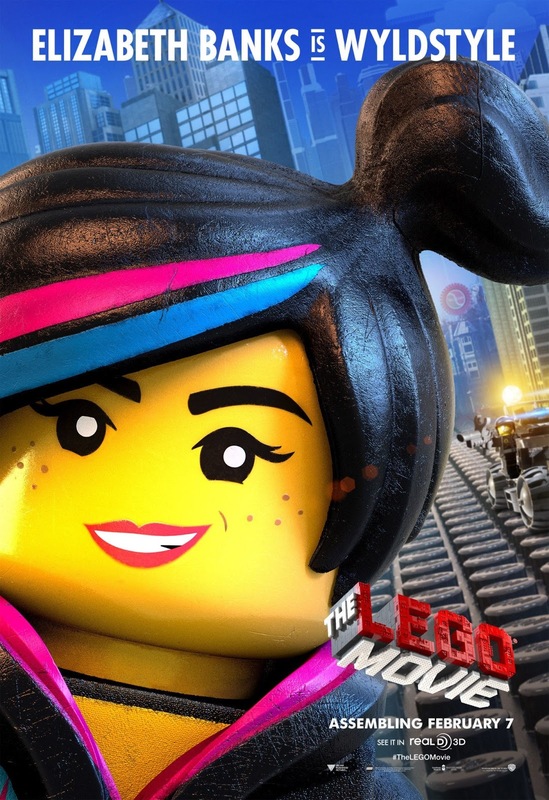 I wonder if the Ninjago and Batman Lego movies that are set for release before The Lego Movie 2 will also manage to incorporate more female characters. 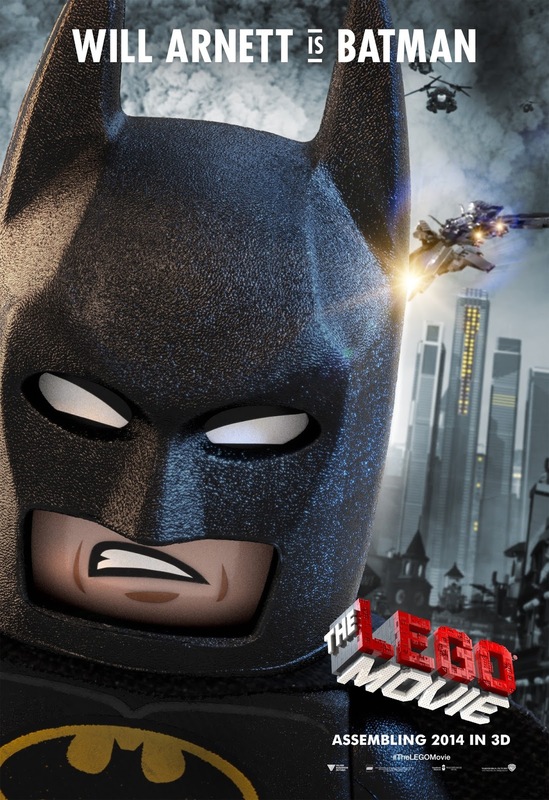 How It Should Have Ended and Brotherhood Workshop have teamed up to make several alternative endings for The Lego Movie. The latest looks at the love triangle between Batman, Wyldstyle, and Emmet, aka Starlord! This delightful ball spinning-build is by JK Brickworks. And you should definitely check out their blog and youtube channel, they have many other equally impressive and creative builds. Hopefully this is exactly what we'll see in a future Lego Doctor Who video game, made like the good old days when the video game minifigures only mumbled and grunted! 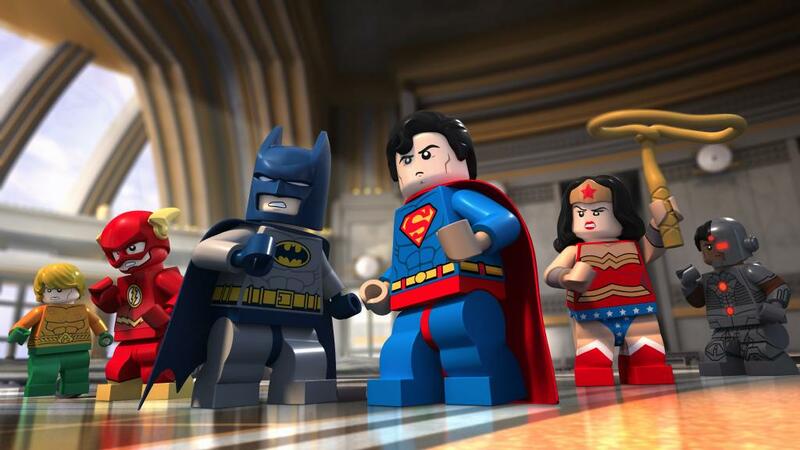 News of another Lego DC Comics Super Heroes animation has surfaced. 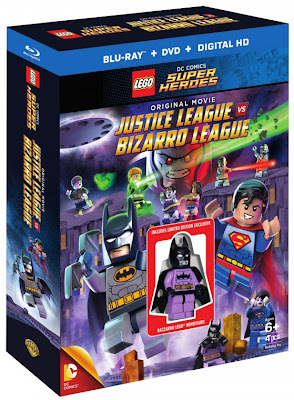 Coming early next year is Justice League vs Bizarro League. A post on the Blu-ray.com forums has revealed the bluray packaging, and the Batzarro minifigure that will be included. 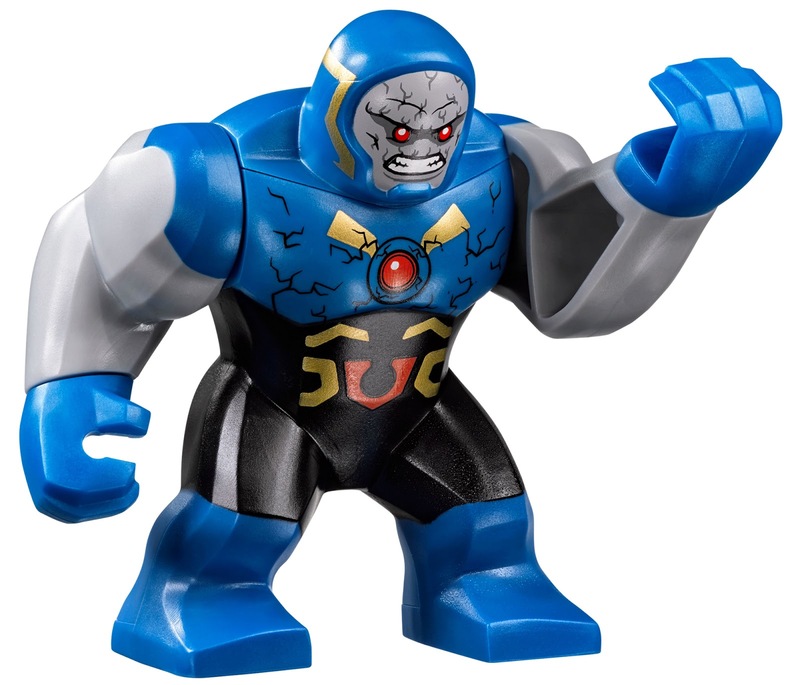 If the trailer is anything to go by, the title might be misleading, as the Justice League and Bizarro League appear to be working side by side against the malicious forces of Darkseid. UPDATE: ToonBarn have revealed further contents from this release. In addition to the main animation the disc will also included another recent animation, Batman Be-Leaguered (see previous report for a trailer). There will also be a blooper reel, and a featurette exploring Bizarro. 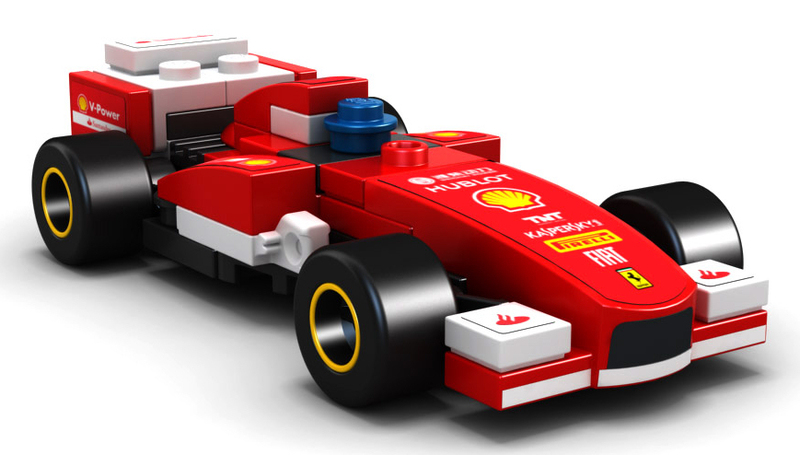 The Lego Ideas have team have announced the outcome of the first 2014 review period, and decided two of the six projects that got to the ten-thousand mark will be going into production, with another two still under consideration. 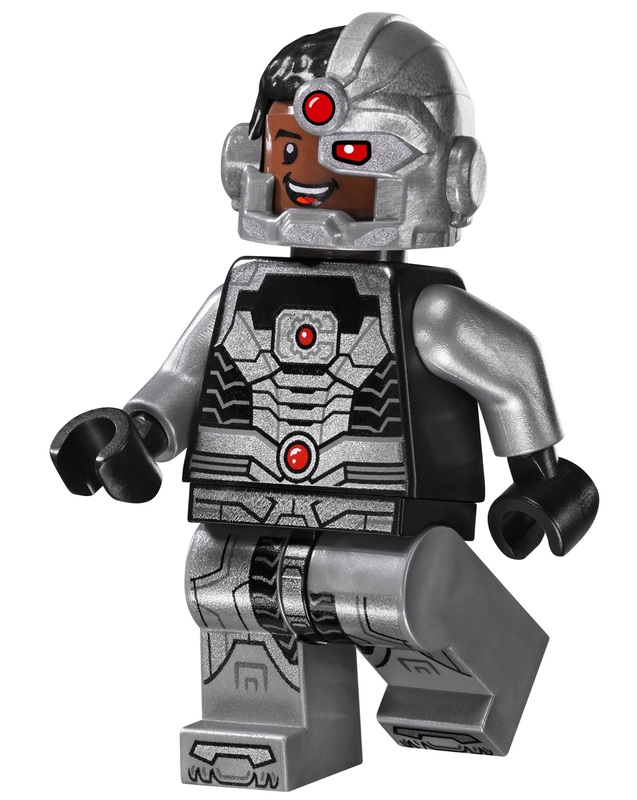 I'm glad to see that 2015 will continue to deliver sets based on The Lego Movie, as the film still has lots of potential for sets - They could mine it for eternity considering how many Lego models there were within it! The three sets coming in the winter wave are all quite small scale, ideal ways to collect the main characters if the larger sets in the second wave of 2014 sets are a little too pricey for you. 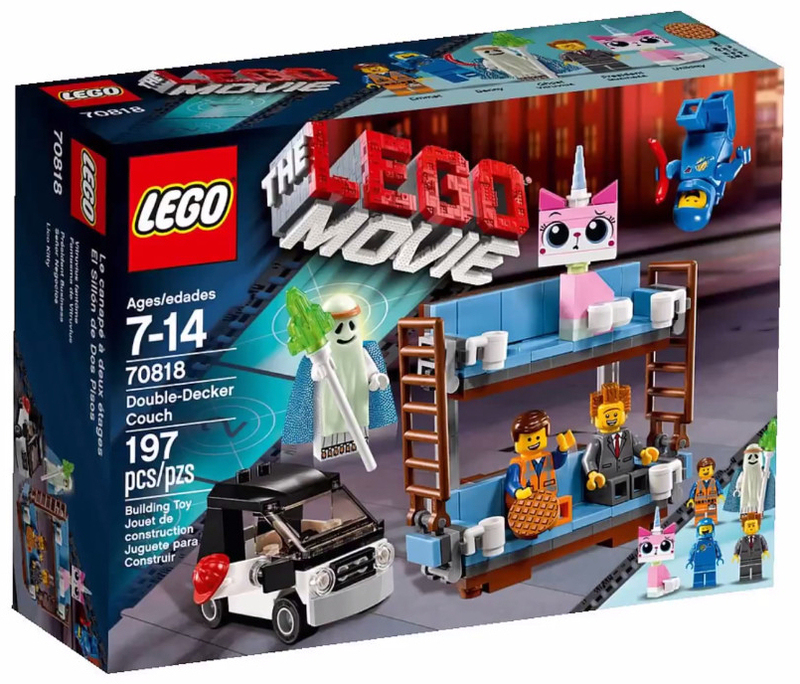 One of the most iconic designs in The Lego Movie - Ok, that might be overstating it, but the double-decker couch is certainly memorable. I'd have loved an all-clear version from the Emmet mind-meld scene, but any version is pleasing. 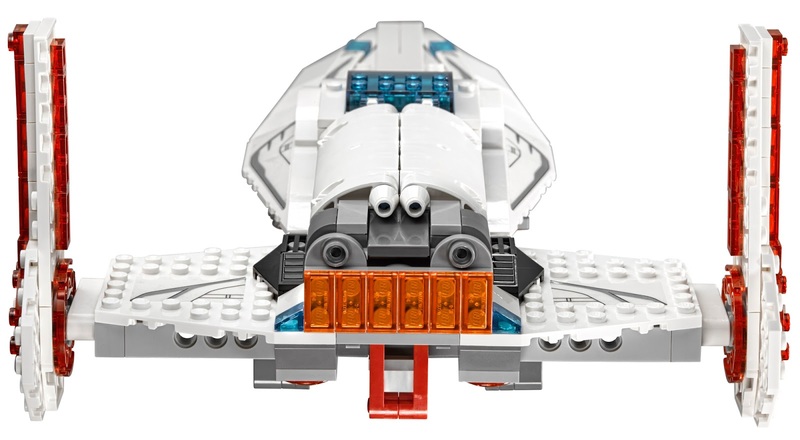 This has already appeared in the much larger 70810 Metal Beard's Sea Cow, so this is the more accessible version, this time coupled with Emmet's car and a jumble of characters from the film, including ghost Vitruvius! 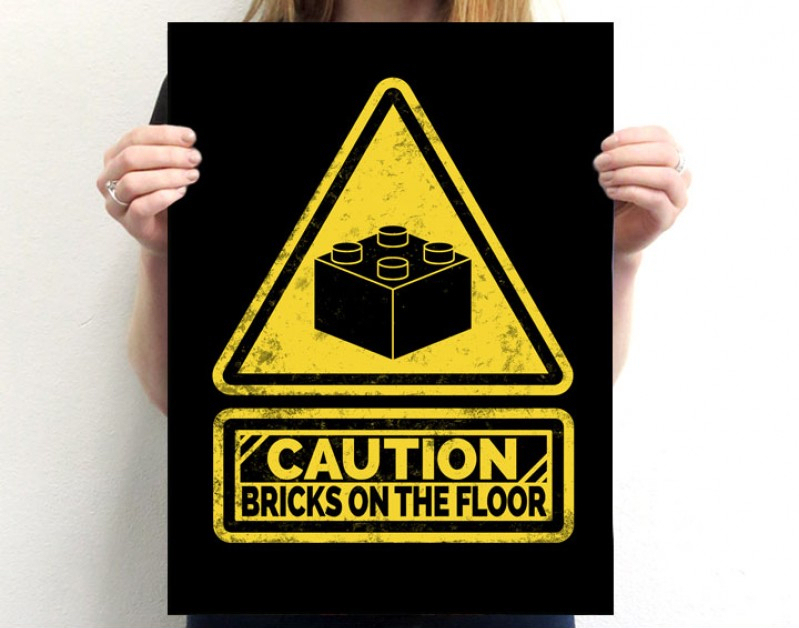 In 2012 Lego released a set of mini versions of the big modular building sets, rescaling the first five buildings in the series down to tiny proportions. 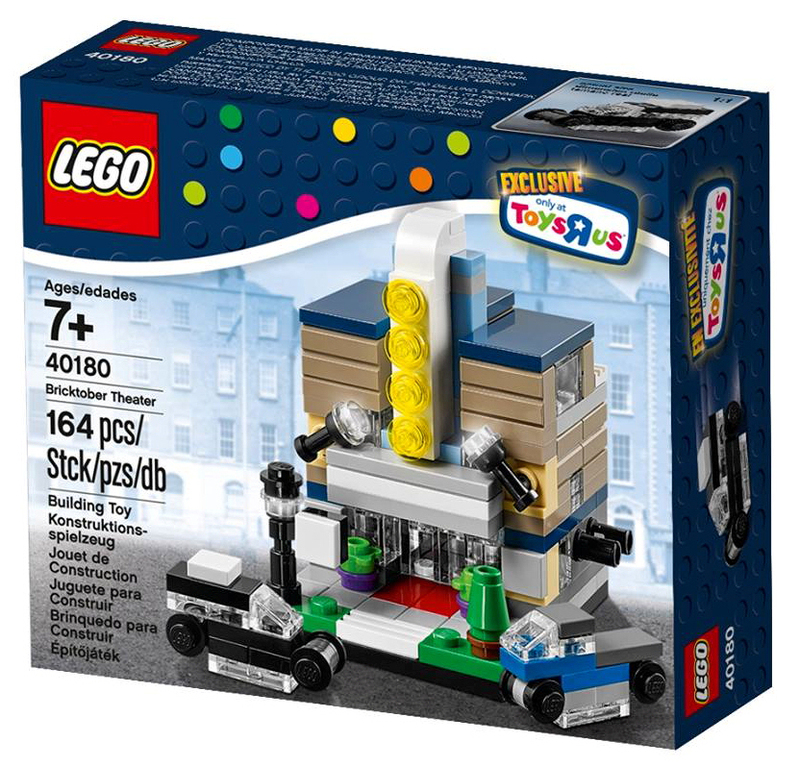 This year a similar effect has been used for a series of four buildings, available exclusively at Toys'r'us' for their Bricktober promotion. 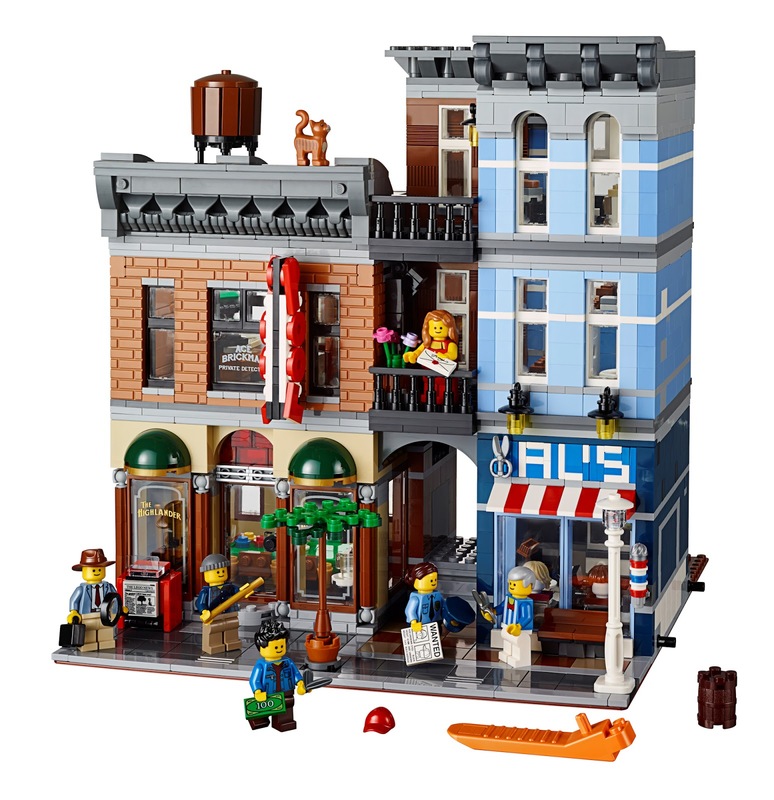 While the new mini buildings reflect some of the same building types as the larger modular building sets, this time they are not really miniaturised versions of other sets, just generic smaller buildings. 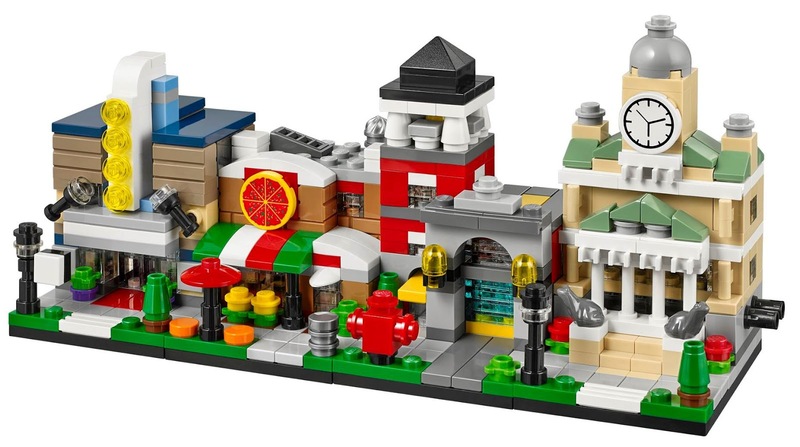 Included in the series is a cinema, pizzeria, fire station, and city hall, each set also comes with a couple of small vehicles to populate the streets of the tiny city. Lego have been working with the oil company Shell to produce promotional sets since way back in the 1960s. 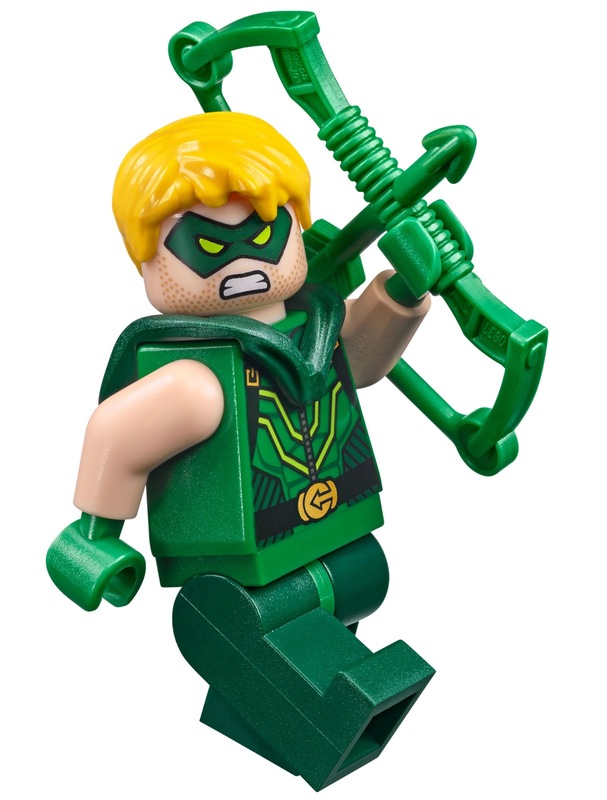 There have been regular releases ever since, and this year those come in the form of seven new polybag sets, available with purchases of Shell products. The promotion is expected to run in several countries, starting in Singapore a few weeks ago. 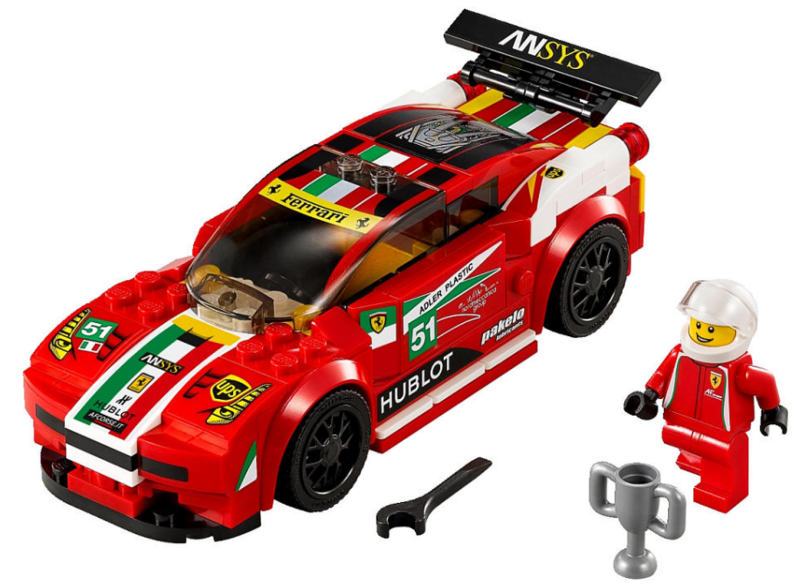 Four cars, a podium/finish line, service station, and a tanker are on offer, with each set available for a limited period of time over consecutive fortnights, with the exception of the tanker, which is available by a different promotion (which varies from country to country).